In many ways, the Brooklyn Bridge, although not a “land” edifice, is the first of New York’s skyscrapers, and an elegant reminder of a bygone era. Three-shot HDR blend, shutter speeds of 1/160, 1/200, and 1/250 sec., all F/11, ISO 100, 55mm. THERE ARE ANY NUMBER OF LANDMARKS IN THE GREATER NEW YORK AREA which reward repeated viewings. Their mythic impact is such that it is never dulled or diminished. On the contrary, these special places (in a city which boasts so many) actually reveal distinctly different things to different visitors, and, doing so, cannot be exhausted by the millions of interpretations of them that flood the photographic world. We make pictures of these objects, pictures of the pictures, a tribute picture to someone else’s picture, an impression of someone’s painting. We shoot them at night, in close-up, in fisheye, in smeary Warholian explosions of color, in lonely swaths of shadow. For me, the Brooklyn Bridge is about two things: texture and materials. After more than a century over the East River, John and Washington Roebling’s pioneering span, the first steel cable suspension bridge in the world, shows its wear and tear as a proud trophy of its constant service. 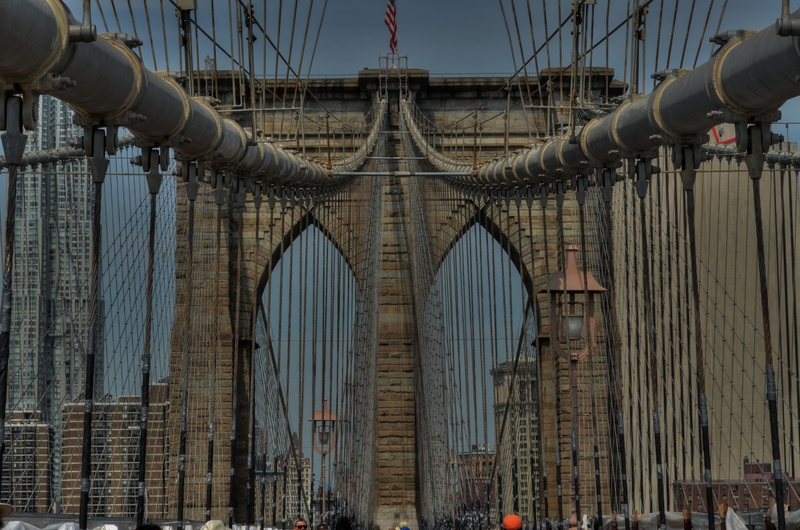 The delicate and yet sinewy cables, amazingly strong interwoven strands of what Roebling manufactured under the name “steel rope”, are the most amazing design elements in the bridge, presenting an infinite number of kaleidoscopic web patterns depending on when and where you look. As simply stunning as its two towers are, it is its grid of steel that mutates, shimmers, and hypnotizes the visitor as he makes his way past the crushing mobs of walkers, runners, skaters and cyclists that clog the span’s upper promenade from dawn to dusk. To show the bridge and only the bridge is a challenging trick. To get the dance of angles and rays that the cables have to offer in a way that speaks to you is both frustrating and fun. Browse through several hundred amateur views of the bridge in one sitting sometime: marvel at how many ways it stamps itself onto the human imagination. Here, I tried to show the steady arc of the master cables as they dip down from the eastern tower, lope into a dramatic dip, then mount to the sky again to pass through the anchors on the western tower. HDR seemed like the way to go on exposure, with three separate shots at f/11, blended to maximize the detail of this most decorated of urban giants. Next time, some other picture will call out to me, and to you. The bridge will display all the ways it wants to be seen, like a magician fanning out a trick deck. Pick a card, it invites, any card. Doesn’t matter which one you choose. This entry was posted on October 3, 2012 by Michael Perkins. It was filed under Architecture, Composition, Exposure, HDR, New York, Patterns, Popular Culture, Post-porcessing, Textures . Thank you so much. I was breathless to find myself walking this magnificent structure.